I think the best thing about writing a blog and having an online presence is all the interesting people I get to meet. Sometimes I eventually get to meet them for real, in person. Other times we continue our online friendships via Skype or Google Hangout to craft together or chat. Sometimes the meeting is only the exchange of email. Recently, I received an email from Olha, who does wonderful work with Halifax Charity Knitters. Olha was researching ways of "speeding up the process of turning [hand knit] squares into blankets". Currently squares are sewn into blankets by hand. The 3-thread flatlock as a solution is what first came to my mind, and Olha's research brought her to the same conclusion before I had the chance to mention it. The 3-thread flatlock is a good choice, when you want to connect fabric edge to fabric edge. It's not an invisible stitch; the flatlock stitches become a design element. I'm sure you've seen flatlock on certain athletic wear, where it's not just used for the design, but also for comfort -- no pesky, thick seam allowances pressing into the skin. 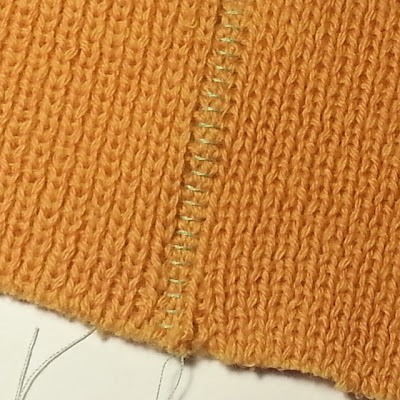 For sweater knits, flatlock can be used to lengthen or widen a too short or too narrow piece of fabric. Just remember the stitches will show. I wouldn't recommend the flatlock for the raw edges of sweater knits. The look wouldn't be tidy. It's possible to turn under the raw edges as I did for my Crazy Crushed Can Cowl/Hat, but honestly, I wasn't too happy with that seam. I wanted to reduce bulk with a flatlock, but I ended up putting it back in with the turned down edges! Now this is where I was to post pics of my sample of the 3-thread flatlock stitch at the serger, with notes on settings, and things to watch out for. I spent 2 hours trying to make it all work with fabric I thought was similar in feel to hand knit. I must have had beginner's luck the last time I did this. I simply was not happy with my results this time. I wasn't neat enough or my looper tension was too loose or needle tension too tight. When I got it right, I tried putting yarn in the upper looper, which threw my tension off yet again. And I then remembered an easier way. Ohla, I think this easy method might work. It can be done on a regular sewing machine. In fact, that picture at the top of this post is an example. Here's the reverse side. The sewing machine mock flatlock is sturdy and has suitable elasticity. I used a polyester thread and set my sewing machine for a wide zigzag, 6.5 mm, the widest on my machine. 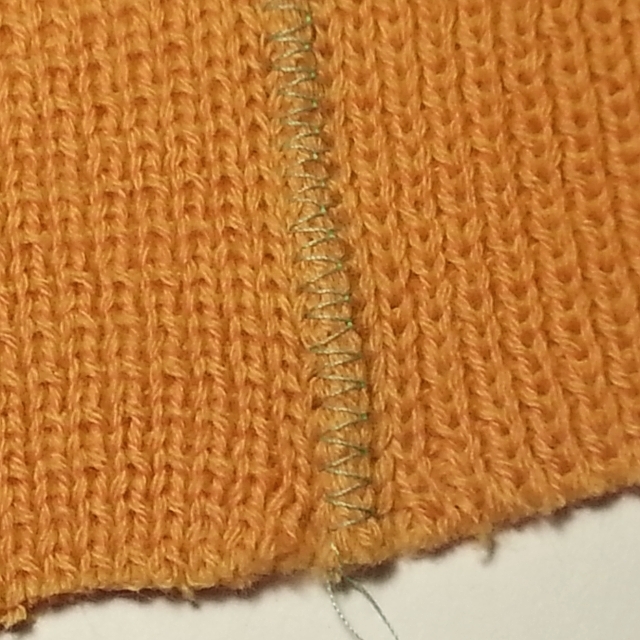 The stitch length was 2 mm. I allowed the needle's swing to the right to go just over the edge of the fabric. My overedge foot (Janome foot C) made it easy to guide the fabric, although I know it can be done with any general presser foot that can handle zigzag. 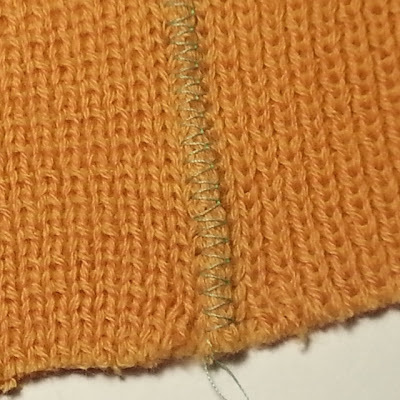 Once I was finished sewing the seam, I opened the fabric, gently pulled the stitches flat. I'll continue to experiment with Woolly Nylon in the bobbin, which has more of a yarn quality, and I'll also play with tensions a little more. I first saw this method used in this fleece socks YouTube video from Jalie. I think this stitch has possibilities for the blankets of squares, Olha. I wish you all the best with the work you do. I can picture this type of seam in a couple of home fashion projects (with sweater knit fabrics) that I have in mind. Or maybe even some socks! Click here for more information on Halifax Charity Knitters. Thank you for your suggestion. I think it would work very well if I had 7 mm zigzag option. I tried it with 5 mm and it wasn't catching the edge evenly. However, you inspired me to play with my sewing machine and if you want to see the result, it's posted on my blog. Sorry the sewing did not turn out exactly as hoped, but so glad there was finished product to donate. The blanket looks very pretty and warm!